Shirts With Random Triangles: West Virginia QB Clint Trickett claims Nick Saban's daughter was the first girl he ever kissed. The bad news for Trickett, her daddy is coaching the team that he and his fellow West Virginia Mountaineer teammates will be facing on Saturday in Atlanta as part of the Chick-fil-A Kickoff Game. 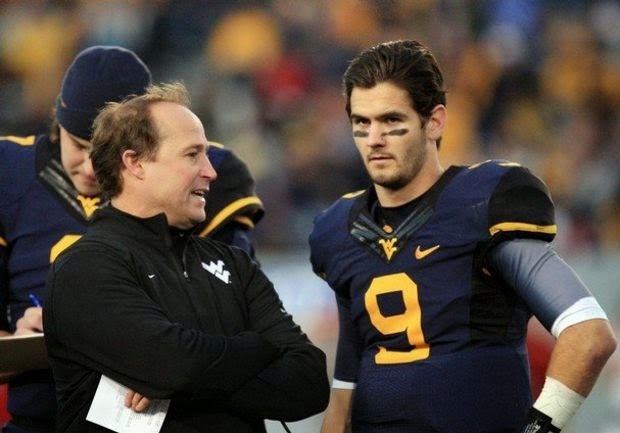 Yes, Clint Trickett once kissed Alabama head coach Nick Saban's daughter, Kristen. It happened when (according to Trickett) they were "like six years old." The subject came up Tuesday when the West Virginia native was asked if he knew Saban. "Asked if he knows Saban well. "His daughter [Kristen] was my first kiss, back in the day. [laughs] So yeah... I don't know if I should have said that. [laughs again] She's actually engaged now. Coach Nick is one of the greatest there is. My brother worked for him. He was a GA (Graduate Assistant) for him when be first got to Alabama. And we've known him for years, family friends and just one of the best coaches out there." Cuts off next question. "For clarification, we were like six years old! Just so everyone knows that." Trickett's father, Rick Trickett, was a member of then-LSU head coach Nick Saban's coaching staff back in 2000. Trickett, who was born in 1991, would have actually been eight or nine at the time.